As the evening Angelus sounded on May 2nd, 1806, Catherine Labouré was born, the ninth child of a family of eleven. 'Our Lady's bell' seemed to herald that a saint, who was to be greatly favoured by her, had been sent by God to the world . . . When Catherine was nine years old, her mother died. When she returned home after the burial, the child took our Lady's statue from the wall, kissed it, and said: "Now, dear Lady, you are to be my mother." On January 25, 1818, Catherine received her First Holy Communion. From that day on she arose every morning at 4.00 a.m., and walked several miles to church to attend Mass, and to pray. One night she had a dream in which she saw an old priest say Mass. After Mass, the priest turned and beckoned her with his finger. The vision moved to a sick room where she saw the same priest, who said: "My child, it is a good deed to look after the sick; you run away now, but one day you will be glad to come to me. God has designs on you - do not forget it." Later, she awoke, not knowing the significance of the dream. Sometime later, while visiting a hospital of the Daughters of Charity, she noticed a priest's picture on the wall. She asked a sister who he might be, and was told: "Our Holy Founder Saint Vincent de Paul." This was the same priest Catherine had seen in the dream. 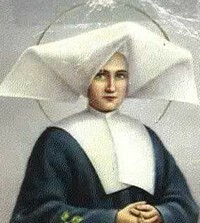 In January of 1830, Catherine Labouré became a postulant in the hospice of the Daughters of Charity at Catillon-sur-Seine. Three months later she entered the Seminary at the Mother House, Rue du Bac, Paris. On the eve of the Feast of Saint Vincent de Paul, July 19, the Sister Superior spoke to the novices about the virtues of their Holy Founder and gave each of them a piece of cloth from his surplice. 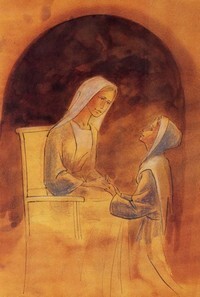 Catherine earnestly prayed to Saint Vincent that she might with her own eyes see the mother of God. Catherine fell asleep. Before long, she was awakened by a brilliant light and the voice of a child. "Sister Labouré, come to the Chapel; the Blessed Virgin awaits you." Catherine replied anxiously: "We shall be discovered." 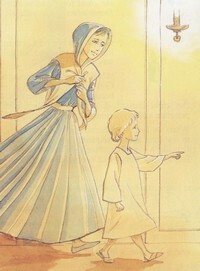 The little child, radiant with light, smiled, "Do not be uneasy; it is half past eleven, everyone is sleeping... come, I am waiting for you." She rose quickly and dressed. The hall lights were burning. The locked chapel door swung open at the angel's touch. Amazed, Catherine found the Chapel ablaze with lights as if prepared for midnight Mass. Quickly she knelt at the communion rail, and suddenly, she heard the rustle of a silk dress. 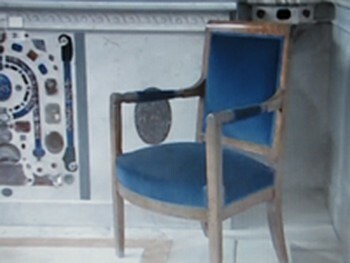 The Blessed Virgin, in a blaze of glory, entered and sat in the director's chair. The angel whispered: "The Blessed Mother wishes to speak with you." "God wishes to charge you with a mission. You will be contradicted, but do not fear; you will have the grace to do what is necessary. Tell your spiritual director all that passes within you. Times are evil in France and in the world." A pain crossed the Virgin's face. 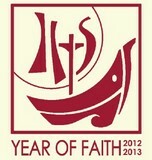 "Come to the foot of the altar. Graces will be shed on all, great and little, especially upon those who seek for them. You will have the protection of God and Saint Vincent. I always will have my eyes upon you. There will be much persecution. The cross will be treated with contempt. It will be hurled to the ground and blood will flow." Then, after speaking for some time, the Lady was gone. 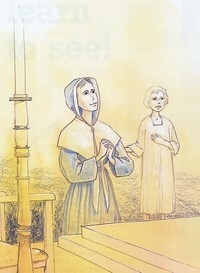 Led by the child, Catherine left the Chapel, marched up the corridor, and returned to her place in the dormitory. 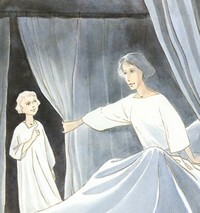 The angel disappeared and as Catherine went to bed she heard the clock strike two. Thus ended the first of the great apparitions of Our Lady at the Rue du Bac, Paris, France in July 1830.